"I don’t know why we would go back," says Assassin's Creed Odyssey's director. Assassin's Creed Odyssey is the first game in the series that lets you choose the gender of your main character, letting you pick between Kassandra and Alexios. It sounds like Ubisoft Quebec doesn't want to go back from that with future games. 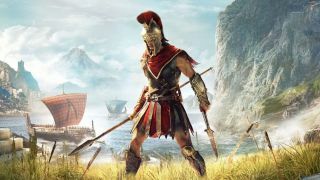 "I think it would be a mistake to limit our players, limit our fanbase from as many people as possible," says director Scott Phillips, speaking GamesIndustry.biz (via VG247), when the outlet raises the subject of how Odyssey marks a turning point for the series when it comes to the player's choice of character. "I don't know why we would go back. We should continue pushing in this direction, bring in more players, more fans to enjoy this experience and make it their own experience." Assassin's Creed Unity's explanation for why you couldn't play as a female character in that co-op game was a bit of a PR disaster. As Tim captured in 2014, Ubisoft's James Therien described it as "a reality of game development", saying that redoing costumes and animation for female characters would double the work for those things. A lot has changed since then, obviously, and it's neat that players can now choose who they play as. I've played as both at preview events, and I slightly prefer Kassandra's voice actor. Back in August, I wrote about how Odyssey will probably have the best combat in the series. Yesterday, Ubisoft released a launch trailer for the game, which is out on October 5th. Finally, Tom has played hours of the game, and wrote about climbing naked statues of Zeus here.